Cancer diagnosis for you or someone you care about? It happened to us and and we got through it with hard work and a lot of humor. "What is the treatment going to be like?" "How will I deal with all of those new medical terms?" "Will my spouse leave me?" "How will I find time to do my normal stuff in addition to treatment?" "How do I deal with all of the people that want to help?" "Is what I'm feeling normal?" ...because I can help you get through it. I can’t give you medical advice because I’m not a doctor. I can’t tell you what is going to happen to you because I’m not a fortune teller. Needless to say, I learned a lot during those four bouts with breast cancer. 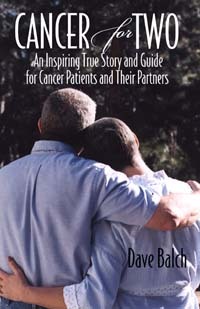 Now I can help you by sharing our story in "Cancer for Two: An Inspiring True Story and Guide for Cancer Patients and Their Partners"
It seems weird that our story can help you, doesn’t it? Well, it can. Even though our experience was with breast cancer, what we went through applies to all types of cancer. Reassure you that you are not alone - what you're feeling is normal. You will find that a surprising number of things that are happening to you also happened to us. The things your friends say and do, the feelings and frustrations we had, the problems we encountered… the letters I get tell me how helpful it was to identify with someone else. Give you a scenario - become comfortable with prospects for the future. When we got the diagnosis, one of my first thoughts was “What’s going to happen?” Obviously I can’t tell you what will happen in your situation, but learning what happened to us will help you understand our course of treatment, which will calm you until you learn what yours is going to be. “["Cancer for Two"] is factual and current and closely relates to what we are going through right now. We were looking for hope and encouragement, along with facts; we found all that and more." Help you deal with other people - reduce the stress caused by well-meaning people. want to help by doing things you don't want them to do? want to help too much? won’t take “no” for an answer? Empower you with specific coping strategies - you find hope when you know how to help yourself. For example, it is important to laugh. LAUGH?? What’s funny about cancer? Nothing… but there is humor in some of the situations you find yourself in because of the cancer. You will be surprised how funny we managed to be in spite of our situation. You will laugh out loud, and that’s a promise! Okay, laughing was an easy one… how about this? During Chris’s chemo we got a postcard from a friend on vacation in Tahiti. We decided to go there when her treatment was over and guess what? That gave us hope. That’s when we learned how important it is to have something to look forward to. It doesn’t have to be as fancy as a tropical vacation though; it can be something as simple as going to the movies on Thursday night. 'don't go there, till you get there'...very profound!! I take it with me everywhere!" Prepare you for your new medical world - you will discover that is isn't as scary as you think. Think of all the new medical terms, procedures, and people you're going to have to deal with. After you've come along with us, you'll have a better idea of what it will be like. Guess what? It won't be as bad as you think it will be. "Cancer For Two is the best book I have ever read and so accurate. I feel the more men and women know, the less apprehensive they will be." Provide the caregiver's perspective - new understanding of the caregiver's feelings and responsibilities. It is surprising how many letters I get that say, "Now I understand what my husband is going through." Bring cancer couples closer together - each of your concerns and feelings will be better understood by the other. "Cancer for Two" saved a marriage. Surprised? I was too! "I had to deliver a cancer diagnosis to a couple in my practice with a rocky marriage. I gave them a copy of your book; the next time they were in my office they couldn't keep their hands off each other! When I asked them what made the difference, they said, 'Cancer for Two!'" They gave us the “five-year survival rates,” which are statistics of patients in a similar situation that have survived at least 5 years. We were shocked: based on those numbers, Chris only had a 50% to 60% chance of surviving 5 years. Here is the surprising insight: “five-year survival rates” are too low! Cancer is not the killer it used to be because advances are constantly being made in medical science that improve the odds. Advances are made so rapidly, in fact, that the “5-year survival rate” figures that we all cling to are too low because they are based on 5-year old medicine. Had you considered that? Patients who survived 5-years had the majority of their treatment at least 5 years ago. Undoubtedly medical technology has improved, probably significantly, since then. "It sounds like you and Chris did everything right, and your insights are wonderful." This isn't just a "this-is-what-happened-to-us" book. Sure, I describe what happened; but also how it felt and what we did to handle it that you can do too. I’m doing this because I know how anxious you must be, and this way you can get started even while you are waiting for the printed book to arrive in the mail. Pay in installments... for a book!. I’m offering this because I know that every penny counts when you are facing cancer. Everyone tells me I’m crazy to spread the low cost of a book over four months. I’m doing it anyway. Access to the exclusive "Cancer for Two" webpage where you can see the people, places, and animals mentioned in the book, and even a video that will complete this sharing experience and get you involved. No-risk, No-Questions-Asked Guarantee. If you do not find "Cancer for Two" to be helpful, simply return it within 60 days for a full refund. Period. That’s how confident I am that Cancer for Two will help you face your cancer more bravely and more effectively. You can wring your hands and wonder what you are going to do and how you are going to get through it, or you can take positive action to help yourself. of anyone's cancer experience anywhere. With no risk - I'll return every nickel you paid if you don't find "Cancer for Two" helpful. Order now on our secure server and in only a few minutes you can download your free e-book and begin feeling a new energy. I agree to make one payment of $18.95 plus shipping. I agree to make payments. I understand that you will charge my card $6.23 immediately, and then again each month for a total of 4 equal payments (total of payments is $24.90, which includes shipping). Order now on our secure server and in only a few minutes you can download your e-book and begin feeling a new energy. I agree to make one payment of $14 (no shipping, of course!). I agree to make payments. I understand that you will charge my card $4.67 immediately, and then again each month for a total of 3 equal payments.